Andrew didn’t go to art school, he was a philosophy major. His freshman year of college he was elected dorm head and one of his responsibilities was to produce a newsletter once a week. This is how he began his career in design. Creating weekly newsletters turned into learning the basics of web design and soon enough, Andrew was an Art Director at a weekly magazine. Now Andrew is running his own design firm, Transom Design. With six employees and a constant stream of work, the company is running on all cylinders. What area of design does Transom specialize in? We do visual identity really well. At least, we enjoy it the most. It’s a design problem in its purest form, almost like poetry. You’re trying to capture the essence of a brand or a company and distill it down to something that is very simple and memorable and easily replicated. Where did the name “Transom” come from? On a boat, the transom is the flat part in the back, most of the time that’s where the name is written. So, It’s a structural part of the boat and without that the boat can’t function, but it’s also an architectural piece; the beam across a window or a door. We loved how the word sounded and looks. We had bunch of different naming ideas and I can’t remember the moment exactly, but I think I was looking through a book on boat terminology and it clicked. Do you have a philosophy when it comes to naming a company or brand? I think there is a fine line between memorable and easily digestible. I love names that don’t bring a lot of meaning to the table with them. There might be some meaning implied, but not a ton. Take Transom, for example; it’s easily to parse, it look just like it sounds, maybe you’ve heard it once or twice, but it’s not in the common vernacular. It’s an empty vessel that you can then fill in with the actual brand. But I don’t really have a mantra, there are so many considerations that go into naming, so something that works for one company will not work for another. How did you land on Transom.design? What domains did you have before that? Transomdesign.com was the obvious choice out of the gate, but that was unavailable. So we just experimented with different permutations of putting Transom somewhere in the domain. We had followtransom.com and, at one point we had transomco.com, which was terrible. People often asked, ‘what’s your company, transomco?’ Then we had transomlabs.com and I thought, we aren’t really transom labs, we are a design company. I eventually saw that .design was coming out and I thought that if we got there early we could get our name and we did. Since getting transom.design, the person who owns transom.com actually reached out to us to sell it. No, we could totally afford it, but, aesthetically, transom.design is exactly what we’re going for. It doesn’t get any simpler than it is now, it’s who-we-are-dot-what-we-do. It’s been really good. I was actually thinking that we’d get more questions about it, but most people just think it’s cool. Some people we have to educate and the rest just go with the flow. Lastly, what advice would you give to aspiring designers? For me, design was what I did in my spare time and it became a real passion. You can certainly be a designer without that, but it sure helps to have it. I know a lot of people who decided that they wanted to be a writer or a photographer, or whatever creative discipline and I would ask them, ” what have you written lately,” or “what photographs have you taken lately?” and they would provide excuses or talk about a class they were going to take. Invariably, I would ask them a year later and they would no longer be interested. Whatever you think your life will be as a designer, that’s not what it’s going to be like. You should be a designer because the act of designing is innately pleasurable to your soul. I would hope that people discover that they want to be a designer because they find themselves designing. From inception, we at .design have felt a commitment to designers of all kinds, everywhere. Combining this ethos with our hometown pride, we find it particularly difficult to turn down any opportunity to support our local creative talent. 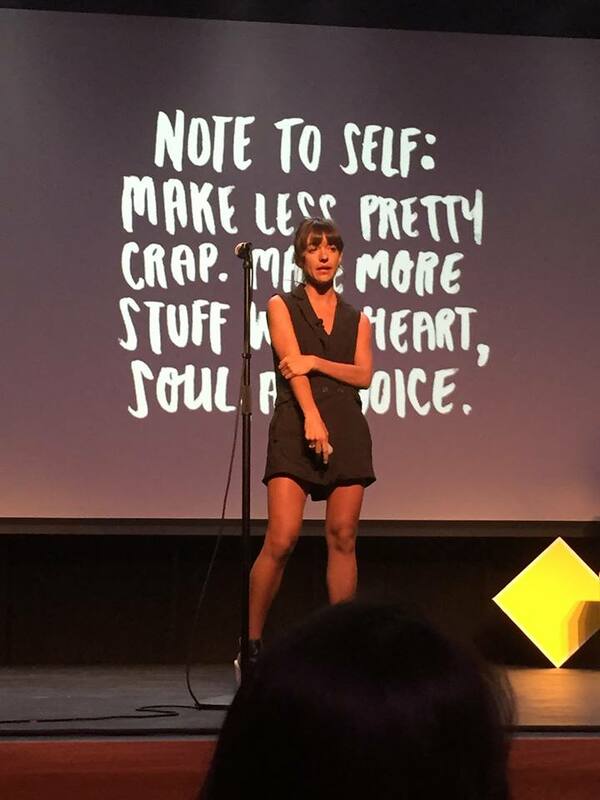 Last Friday night, AIGA Portland brought Jessica Walsh to town for a speaking engagement, and graphic.design had the honor and privilege of sponsoring the event. Not only that, but I had the opportunity to attend in person. Jessica captured the rapt attention of her audience with her humor, words of wisdom, and examples of work, both personal and professional. Her belief in the power of play and her commitment to passion projects is truly inspirational. Tell us what inspires your creative work on Graphic.design’s Facebook page. Skyline of Portland Oregon, Porkbun’s home. Photo by Amateria1121. We are an overall solution provider of all things domain and website related. We’re just getting started so please bear with us while we construct what we believe will be the best platform on the web for registering, managing, and hosting your domain names. Want to get started? Visit porkbun.com and see what we have to offer.